Certainly reminds me of freebet, but I like this version more, actually. I was going to make that comparison too. The dreaded question with giving players something extra in blackjack is what to take away, when there is so little meat on the bone in conventional blackjack. I could complain that I don't like mandating side bets, but what is better? If you are going to go the route of mandating a side bet, I'd go the whole way and have totally free doubles and splits and depress the side bet to pay for it. However, then it comes more of a Free Bet copy. In the end, my question to you would be, "How does this improve upon Free Bet BJ?" Wouldn't this be a headache for the dealer and the casino? When you're dealing with a crowded table with drunks, not only will the dealer have to constantly provide change to players who need to put up the contrast-wager which is half, they have to verify that the wager is correct. This back and forth may slow down the game and the casino may not like the pace of it. It's just my personal opinion. Otherwise, it looks interesting. Yes, Just like any New Games or Side-bets, most of the time it is not easy for the Dealer. e.g. Push 22 (and that is why it is not easy to make a New Game). The good thing with variations of Blackjack or Poker is you don't have to teach the Dealer or Player how to play the main-game. That is why most successful games are variations of Blackjack or Poker. 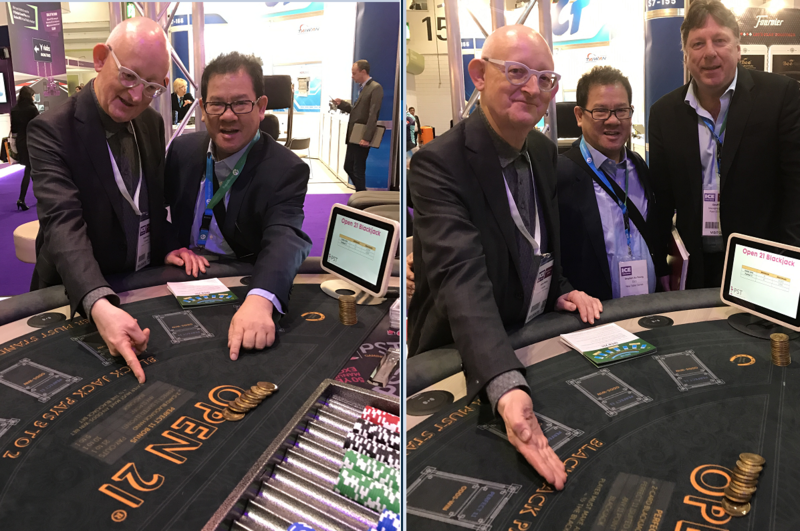 BTW, Top-Up® Blackjack™ may not have been invented, if my best friend Geoff Hall (Switch) still owns Freebet Blackjack. Thanks for answering my previous post(s). I now have another question, can the player refuse the automatic win on 21, if he wants to double it as a soft 11? If the player is allowed to, he would probably double a soft 11 against a dealer 2 to 7, if the Contrast-wager had "automatically lost". Note: the only soft 11 the player shouldn't double is a 2 card 21 (Blackjack). Again, seems like a great game, and I will want to try it the next time I am in the US, or when it is available in Australia (as that is where I live). Yes, You can refuse the automatic win on 21, if you wants to double it as a soft 11. BTW, It is a Brand New Game, so it is not in any Casinos yet. I agree with Sieg that this will be a bit of "a headache for the dealer" at least for when they are new to dealing this game, but I don't think the game will slow-down enough for the casino to "not like the pace of it" (see below). I think the house edge is about 1.94%***, so the game needs to be 3 to 5 x slower than a regular BJ^^^ game before the casino will "not like the pace of it". ***: according to a post somewhere else on this forum, sorry I can't remember the link. ^^^: compared to BJ games with about 0.65% to 0.39% house edge. Also, once people are used to playing "Top-Up BJ", I think it will take less than 2 times as long to play a hand ,compared to regular BJ (this is just a guess, as I haven't tried playing it yet). Most of this is just a personal opinion, so I will be happy to be corrected (if I am wrong in any of the statements above). I don't know if the average player prefers a faster paced or slower paced game, but I personally don't care about the pace of the game, as long as the other players are not being "annoyingly slow or bad"^*^ with their decision making. ^*^: I have been at a table where I had to leave, because one player was taking about 30 seconds (on average) to decide what to do with "easy" hands and then after all that time they would make a "wrong" decision. For example, one player took 30(or so) seconds to decide what to do with a hard 12 against a dealer 7, in the end they decided to double down (this was in a game similar to Spanish 21).